Hi, I am interested in your 1969 Chevrolet C/K Truck (stock #4715-ATL) listed on Autotrader for $19,995. I'd like to get more information about this vehicle and confirm its availability. This 1969 classic Chevrolet C10 is anchored by a drivetrain thats in top form to dutifully serve as a foundation for whatever you decide on. Its seen relatively light duty since its restoration and also features a very comfortable, nicely restored interior that makes it a pleasure to drive. Coming along right in the middle of the C10s second generation, this 69 has a decidedly more modern look to distinguish it from its first generation predecessors. Its shortbed configuration really emphasizes its stout and sturdy appearance, while a 3 drop provides an element of custom cachet without going so far as to mess with the ground clearance needed for everyday driving. The red shade it wears is a fine match for a vintage truck like this but could use some attention in the form of a comprehensive detailing to bring out its best. From front to back, the exterior fittings all seem to be original and present pretty well, and clear glass surrounds the cabin, but when you get a good, close look at this truck you cant help but imagine what could come from a trip to the paint booth and a freshening up of the trim and bright work. The tan interior was restored a while back while retaining its factory appearance and has come through the years in strong fashion. Its got a lot going for it - the cloth 70/30 split bench seat at its center is in downright great shape, showing minimal wear as it sits over a carpet in matching condition and the door panels to each side are also very sharp. The vibrant look of the painted interior surfaces really catches your eye, especially on the dash, where youll also find a collection of nice, clear gauges in the instrument panel and a straight, uncracked dash pad running over the top. The distinctive B&M shifter stands by within easy reach on its pedestal, while just beyond it an updated AM/FM/CD player waits to supply your soundtrack while out on the road. Additional comfort features include a tilt column and power windows. A number of air conditioning components are also already installed - youll find a compressor under the hood and in-dash vents hold their place on the dash, and just a few plumbing parts and a little attention should have it back online. Mechanically speaking, this C10 strikes a great balance, in that its configured with plenty of power without sacrificing real world drivability. Theres a 350 cubic inch ZZ4 V8 sitting between the rounded inner fenders of the engine compartment that was installed a while back but has seen light usage ever since - only about 30,000 miles. Its armed with Centerbolt heads, as well as a mid-rise intake and 4-barrel carb and sends a nice, deep note out of its long tube Hedman headers leading to its dual exhaust. The TH350 transmission just behind it was rebuilt along the way and shifts very smoothly, so this is a drivetrain thats well positioned for many future miles of enjoyment. While most of its competitors still featured leaf springs in back, this Chevy emerged from the assembly line with coil springs in both front and back, so its got a surprisingly smooth ride. Power disc brakes at all four corners bring its set of 15 steel wheels wrapped with BF Goodrich tires to a halt in short order, while power steering makes for easy navigation. 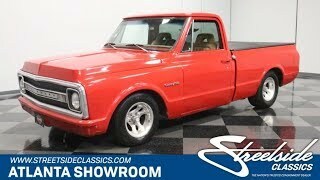 Ready for the road as soon as you get it home and holding plenty of potential for personalization, this 1969 Chevrolet C10 has a lot to offer at a very attainable price. Call today!